I love the jewel names, amethyst, tourmaline, emerald and aquamarine, given to this group of riverboats. 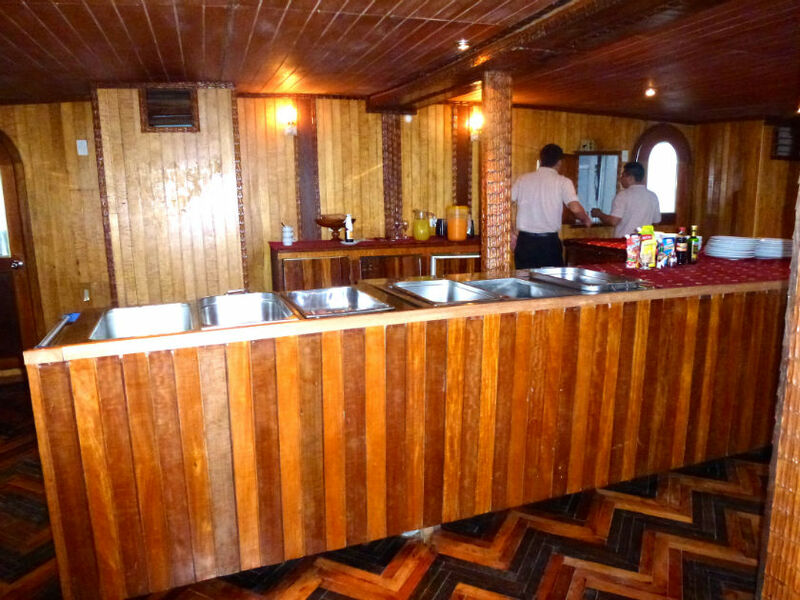 La Turmalina, the ship on which we traveled is part of a fleet of four, built in the ship yard in Iquitos in the style of 19th century river boats. La Amatista and La Turmalina can take 30 passengers and La Esmeralda and La Aquamarina can take 17 and 24 passengers respectively. 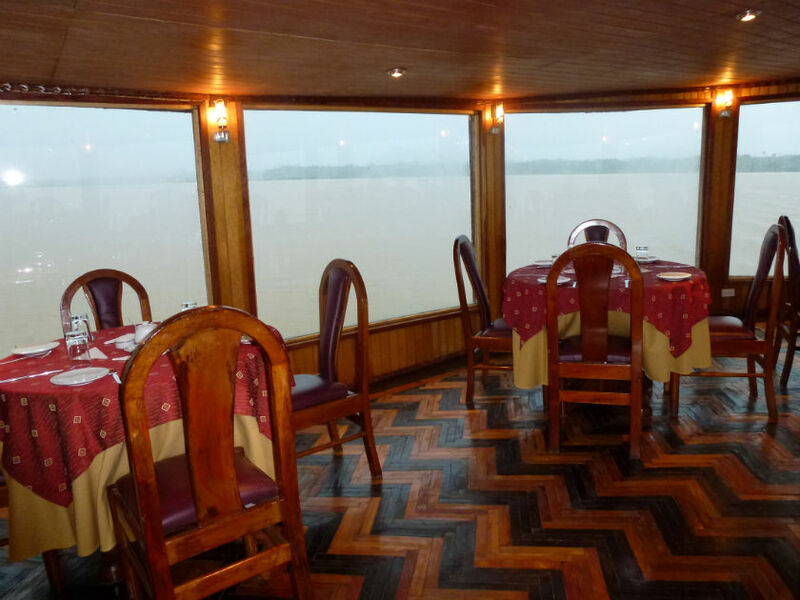 La Turmalina, our expedition riverboat is registered in Peru and operated by English speaking Peruvian Officers and crew. There can be up to 14 crew members on board for a full passenger contingent. Our group of passengers numbered only 16 which was great for us - we were never rushed or crowded, and the number of crew was also correspondingly less. Our ship was originally built in 1994 and refurbished in 2008. It has 15 passenger cabins on 2 decks and a passenger capacity of 30. Although built in the 19th century style, she is hardly 19th century in the interior features. I had a cabin on the lower deck. 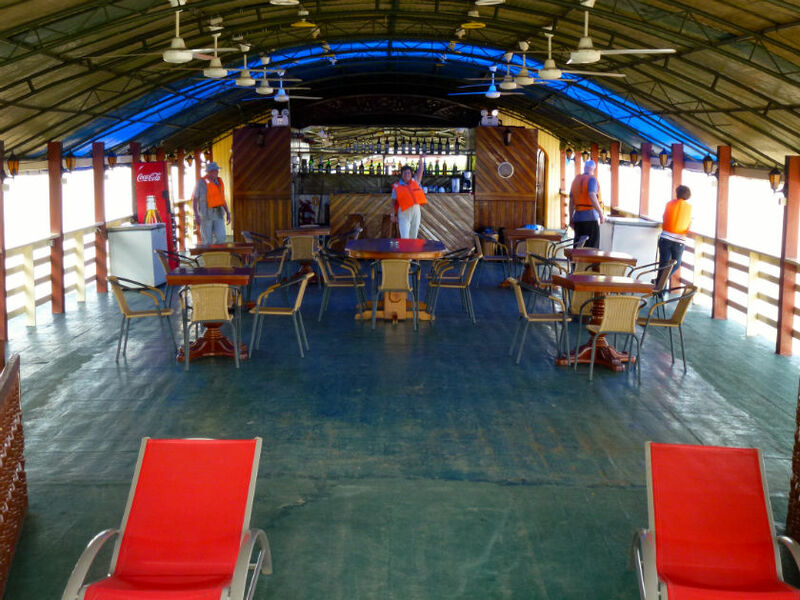 Each cabin has a private bathroom (shower and toilet) with hot and cold water and was mercifully air-conditioned. There were no “luxury” items such as a hair dryer, as on a regular cruise ship, so I got Stephen, my cool Yaletown hairdresser, to cut my hair short; easy to dry with just hand shaping. The dining area is on the middle passenger (second) deck and there is an open bar area and observation area on the top deck. The bridge is on the second deck at the opposite end to the dining room. The dining room was kept cool and largely insect free. The tables had brightly colored tablecloths and always looked inviting. With 4 seats per table and no fixed seating, the passengers mingled at meal times and we all got to know each other early in the trip. Breakfast and lunch was buffet style but each night dinner was served to us formally by the stewards. Food was included in the cost of the tour but alcoholic beverages were not. Payment of the on-board account at the end was by credit card in US dollars. On this cruise there were 12 of us from the Alumni Association group, and two other couples who booked independently. The latter four proved to be an excellent addition to the group, So there was only the 16 passengers on board which made for a nice contained and friendly group. As you can see from the deck plan for the observation deck, about two /thirds is under cover, and one third is open to the air. On the observation or top deck there was space to dance. The surface is a bit uneven, but as was pointed out "if you can keep your balance on this surface think how easy it will be back on a regular dance floor." That's me at the far end next to the bar in the bright orange life jacket, just before we left on an excursion.